Are you tired of chasing slippery bracelet rings around your wrist? Have you stopped wearing your favorite jewelry because putting it on is simply too frustrating or difficult due to limited mobility? Our handy jewelry helper makes it easy to put on all your beloved pieces, allowing you to fasten your bracelets with ease. Save time and hassle with this thoughtfully-designed bracelet helper, and make getting ready easier than ever. Our jewelry tool can also be used to fasten necklace clasps, offering excellent versatility and value for an affordable price. The bracelet tool securely holds the fastening ring on one end of your bracelet, so you can easily close the clasp without frustration. Unlike other jewelry helpers, ours is made from high-quality metal for durability and is designed to avoid damaging your treasured jewelry. It fits easily in any purse for on-the-go use, and makes an excellent gift for friends and family alike. Measures 6” long. I have difficulty putting on bracelets & had been looking for a product like this. This works really well. It is very simple to use. It is long enough to hold in my hand, keeps the end of the bracelet still so I can hook the other end. I plan to purchase some more of these for gifts. This is a sturdier version than the one I lost years ago. I was always looking for a replacement and never found one untill now. I even tried to make my own! Not a pretty site, lol. I was excited to see this and purchased about 10 of them for my family and freinds. My husband has arthritis and couln't help put my braclets on, and so I wore the same old one for weeks, now I have a different one every day thanks to this! I bought this for myself and 2 of my friends. They were really happy to get them as they had never seen anything like it. When you live alone it is a great tool for hooking those hard to clasp bracelets. Live by myself and have used one for years. Just bought one for a friend who recently became a widow and commented that getting her bracelet on by herself was just one of the new little difficult things. This is great for anyone having hand issues, easy to use and very helpful. It takes the frustration out of putting things on your wrist. It's so much easier to get ready now. No need to carry bracelet with me to have someone else clasp it. Great invention - No longer have to get help putting on my bracelet. I bought two, one for home and one I keep in my suitcase for travel. This is a handy little gadget that works great. bracelet the first try, everytime. I bought 1 for myself as well, but my daughter keeps takeing it to her room. So when I want to use it I have to go looking for it in her room. Tool worked just as I expected it would! At last I can put a bracelet on my right arm by myself. I don't have to ask for help!!!! I bought this item to help me put on a new watch I got. I could not get the watch clasp hooked no matter what I tried. With this bracelet clasp, it is a piece of cake! Works great every time. It really helps me to put on bracelets I wouldn't have been able to wear otherwise. I've waited for a product like this. It really helps when my hands are sore & when I'm "clumsy." Price is not expensive. It's of good quality. I'm thinking to have a spare, or to bury more for gifts. Thank you. It holds my medical bracelet,very easy to put on. I have artificial nails and this product works very well to hold the eye steady. It has also proven extremely helpful when the bracelet is snug fitting. When you have arthritis you need help with a lot of things. Love wearing a bracelet and now I can put one on easily than before. Easy to hold end of bracelet. This is absolutely great when you don't have that third hand to fasten your bracelets. Not to say that it has replaced my husband, but close! Don't know how I ever lived without it all these years! Helps you stay independent. No need to bother anyone to help you with your bracelet! This is a great item, I bought 2! I no longer have to wait for my husband to hook my bracelet. This tool allows me to clasp my own bracelets without the help of another pair of hands. I love it for those hard-to-clasp bracelets. It takes the place of an extra set of hands. Anyone that wears bracelets should have one! Where has this been all my life? So many bracelet clasps are a struggle and this item holds one end of the bracelet like another hand. The bracelet tool is great. I have even given it as a gift to some of my friends. My mother says that this is the best tool since refrigeration! Wish I had this years ago. My husband is happy that I don't wake him up to help with bracelets anymore. What a great idea now I can put on all my jewelry without help. Fastening some bracelets can be almost impossible for someone living alone. This easily-held device steadies the ring end of the bracelet to allow for more easily hooking it with the clasp. It eliminates a lot of frustration! This is nice to have when no one is in the house to help you put on your braclet. Have to learn how to hold it for it to work as it should. Great for Senior Citizens. With essential tremors, accessorizing was impossible without my husband or children available to clasp or hook. Now I can actually put on my own bracelets and necklaces without help! This is a great & clever idea, so handy for anyone who needs to have an extra "hand" putting on a bracelet, when no one else is around to help you. Just clasp the ring end of the bracelet, hold it close to your wrist as you pull the braclet around, & hook the ring end with the clasp. Very simple, I even ordered another for my 88 year-old Mom with arthritis, living alone. The original price was great.....for this price, get several, give to friends!!! Makes putting jewelry on a one person job. Something I should have invented. The only thing is the jaws need tape or other protection to prevent damage to the bracelt. I love this. I also had problems getting bracelets to close by myself. I bought it because I always had to get help putting on my bracelets, and I have many. It worked the first time I used it and I've told all my friends about it. A wonderful product! This bracelet tool can't be beat! I had one for a long time & lost it during travel. So glad to have another. I can always put my own bracelets on now with ease. I am lost without mine! I recently lost mine and now I find I cannot put my bracelets on without it. Whether you are old or young, this is a must for helping to get your bracelets on correctly. They make a great gift for your female friends. This is exactly what I was looking for and lives up to all expectations. Great tool for assisting me with my bracelets. Love it! I will use this just like it is meant to be used until I find more things for it to do. Really needed this item. Very handy . Bracelet connector tool. Easy to use. Works great...exactly what I needed. This works perfectly as I put my bracelets on in the morning. Convenient and time-saving. Great idea! I don't have to tape my bracelet to my arm anymore! Very thankful that I got this! My husband recently passed away and I have a couple of bracelets that I can't put on myself so this really helps me to wear those special braclets!! I was widowed and no longer have someone to help with clasp bracelets so I wasn't wearing them. Now I can again. I lost mine. Replaced it with same kind. I had the same one for 20 years until I lost it in a move. I love it. I can put ibracelets on by myself without help. I will always have one of these. Why did I wait so long to get one of these? I struggled for so long trying to clasp a bracelet. Now I can wear my medical one everyday. Great for putting on a bracelet. I had gotten me one a couple years ago, gave as Christmas gifts this year and all my friends loved it. The jewelry clasp is a great timesaver. I was very doubtful about this and wasn't going to buy it but I'm so glad I did. IT IS TOTALLY AWESOME!! 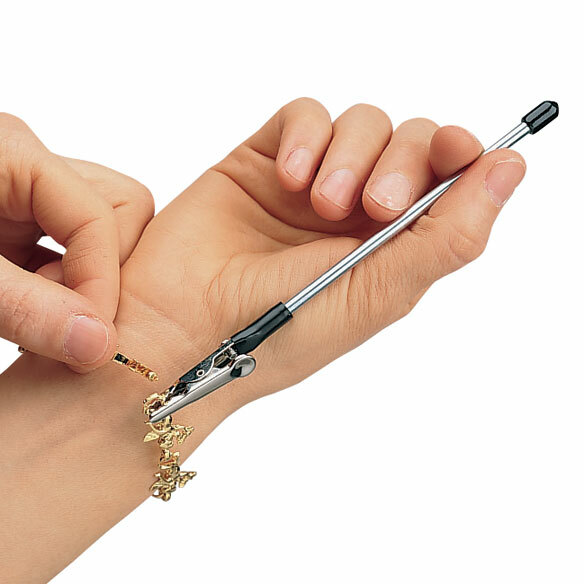 Very easy to use and very helpful for putting on a bracelet when no one is around to help. The bracelet clasp is the best product ever! I have long had problems putting on my bracelets but now it's done in a matter of seconds, without help! I bought one for each of my friends, as well. They love them too. a must have for every lady. I have arthritis in both hands and it is difficult for me to clasp bracelets. I saw the jewelry and bracelet clasp in the magazine and was skeptical at first, but wanted to see if it would actually work! I was amazed. It works so good that now I am able to wear my bracelet anytime, even on bad "hand" days! Allows me to wear jewelry when I can't work the clasp with arthritic hands. This is my favorite tool for my jewelry. I use this tool for putting on my bracelets. I would not be without it as it makes that so much easier. I bought 2 more to give as gifts to friends. It stores easily and packs well. I recently used the jewelry clasp to put on a delicate bracelet. I was having great difficulty closing the bracelet until I thought about my recent purchase. I used it and had the bracelet on in less than a minute. This is great for people who have no one to fasten jewelry for them. I wish I had this years ago, it would have saved me a ton of grief! I no longer have to bother my husband to help me put a bracelet on! Every female should have one! I love this great invention! I use this product to help with putting on bracelets and especially my watch. Great invention for a person living alone without any help in these situations. I love it. I have this also & it works great. What an exceptional jewelry tool. Now I can connect my bracelets easily and save time. I use this to put on my bracelets. Bought a 2nd one for my travel bag. Really my 3rd bec first time I ordered one for myself and one for my daughter. I finally bought one and now I'm back to get some for gifts. It takes a little getting used to this but works better than chasing that bracelet loop. I DO buy this item over and over again. This Bracelet Tool is such a handy thing that I have been buying them for myself and to give to friends for several years. I am a widow and have no one to help fasten my bracelets. This is such a blessing to have. I have one in my bedroom, with my traveling bags, at my father's (I stay with him to help him frequently), etc. I can't begin to tell you how many times I have shared them with friends who love them as well. I try to always keep at least 2 ahead to give to people. When Milles Kimball did not carry them for a few months, I almost went through withdrawal!!! Fortunately, the kind customer service lady told me when they would be carried again. Thank you so much for keeping these in your catalog!!! Neat, valuable tool to have! I have a dozen bracelets and never wear them. I do NOW. I always had to have someone else around to help put on my bracelets until I got this. It's a great product! Needed to make jewelry easy to put on. I used this to put on a bracelet and it did a good job. gets your bracelet on in seconds!!! Great when the husband is not around to help with clasps!!! A must-have for bracelet lovers! This works as a third hand. It's very easy to use and necessary for someone living alone. You can wear your favorite bracelets again! Bought this for my recently widowed Aunt. Now she can wear all her bracelets w/o bringing them to her destination to get help putting them on. This is why I am her favorite niece!! I have acrylic nails...this is a great tool for pulling the watch stems to prolong battery life and its hard with thicker nails...lost mine now I can replace it at a great price. I always need help to put my bracelets on, now I can do this by myself...it's so good to have the choice to wear a bracelet or change the bracelet without help! I had one but it broke so this is my replacement. Got 2 this time. After seeing how easy mine was to use, my friends and co-workers wanted it. I have ordered the bracelet clasp from you for years. They are great gifts and inexpensive. The clap makes putting on a bracelet easy. I consider the clasp a necessary jewelry item! This is the greatest time saver when I need to quickly fasten my bracelets before going to work in the morning. I have a pearl bracelet with a fish hook fastener that I could never get fasten so I never wore this piece. Now I fasten it so quickly! Just place the clamp on end of the bracelet, then hold wand in one hand and fasten with the other hand. What a great device! I live alone and have no one to help me put on short bracelets with spring ring clasps and lobster claw clasps. I have some bracelets I have not worn for years because of this problem. Now I am wearing them again with the help of the Jewelry Helper. Practice makes perfect when using this item, but it is so worth it to be able to fasten my own bracelets without asking for help. I love this item and use it everyday. My daughter finds it very useful in putting on her bracelets. Couldn't do it without it!!! The bracelet helper is so easy to use. I don't have to worry about breaking my bracelet anymore! The product works and I would recommend this for anybody who has trouble with putting bracelets on by themselves. There are fancier and prettier versions of this, but for the price it does the job. THIS PRODUCT IS USED TO HELP YOU PUT ON YOUR OWN BRACELETS WITHOUT ANYONE HAVING TO HELP YOU. I'VE HAD ONE FOR MANY YEARS & MY TWO FRIENDS WERE BOTH HAVING A LOT OF TROUBLE PUTTING ON THEIR BRACELETS. SO FOR CHRISTMAS I DECIDED TO GIVE EACH OF THEM A BRACELET TOOL. THEY BOTH LOVED THEM & HAVE USED THEM MANY, MANY TIMES NOW. I tried to use it and it gets easier all the time. Great product for a great price!!!! The bracelet fastener makes self-fastening bracelets easy if you don't have anyone else around to help you. The price for the product was very reasonable and they quickly shipped. I use it every day to put on my bracelets. I use it to fasten bracelet clasps and necklace clasps. It is easy to use and saves so much time. I don't have to ask my husband to fasten them for me anymore. This is a product that truly works the way the advertising says it does. I've struggled with a bracelet I love, and this makes it an easy couple of seconds to put it on. bought it for my teenage daughter when I was tired of always doing up her bracelets! works great. Purchased this for my boss. She said it does a great job. Bought four as gifts & I'm keeping one. Seems to work well. The jaws of the alligator clips on two were a bit off kilter but hope they will work. Ingenious idea & great help for a widow or single trying to hook a bracelet clasp alone. THIS IS A REALLY GOOD TOOL TO HELP GET YOUR JEWELRY ON. I LIKE IT ALOT. I really like the clasp and I wish I had more for gifts. A great product to make putting on bracelets much easier. Very helpful for clasp bracelets. This product is very helpful for putting on bracelets with clasps. Makes it much easier to attach the two ends. It Helps A Lot, But It Is Hard To Get Used To! I have a lot of trouble with my hands now so this device enables me to wear my jewelry again. It is a little awkward getting used to it. My hands shake slit is a bit short for me to hold onto. For those who live alone and want to put on a bracelet, this is the best product. Now I don't have to sleep in my bracelets. Need to get the hang of this yet! Still learning how to use this product. A great gadget that actually works. the length of the bracelet. I would have them coat the clip with rubber. I would not use it on a fine piece that might scratch. It helps out with the bracelets that are the hardest to clip. I've always had trouble with bracelets - especially when my husband isn't around. This gadget is great. I love this! I have arthritis AND short fingers, this makes putting my watch on effortless...the only improvement I can see is to have the 'trigger' for the clasp to be long , up to the top of the arm so it could be opened and closed with the same hand. Otherwise, this is a GEM of an item !! Takes the struggle out of putting on a bracelet. I have many bracelets that I never wore because I couldn't put them on by myself; now I can enjoy them. It's such a little thing, and I didn't know how useful it would be until I actually got one. Now I can wear the bracelets I left in my jewelry box because I couldn't fasten them myself. The productsthat I ordered are fine. I was very frustrated by the shipping cost for my order. I had a $10 coupon that was used up by shipping! Then when my order arrived, there was a coupon inside the box that had already expired. Very disappointing. Used product to put on bracelets. THIS WORKS GREAT FOR SOMEONE WHO HAS ARTHRITIS IN THEIR HANDS. IT WORKS GREAT FOR SOMEONE WHO HAS SHAKEY HANDS. ITS WORKS GREAT WHEN YOU NEED AN EXTRA PAIR OF HANDS TO PUT ON JEWELRY. MY MOM LOVES HERS. IT MAKES A GREAT LITTLE GIFT. This is very helpful when you need to put on bracelets with clasps and you have no one to help. great when one does not have the extra hand to put on bracelets. I bought this for a friend after purchasing one for myself. It was so helpful and I knew she also needed assistance putting on her bracelet. She was thrilled. Great product. So easy to use. This has been very helpful. I'm able to wear bracelets that I was unable to put on before. As a stroke survivor now on blood thinner, I was told to wear an ID bracelet with my doctor's phone number on it, I take the bracelet off for a shower, and then struggle to put it on again. This handy dandy device makes putting on a bracelet so much easier and I don't have to seek help to get the job done. jewelry helper, I needed this because some of my bracelets I could not manage to put on by myself. I love this! It's so easy to put my bracelets on now. I used to ask my husband to put my bracelets, but now I can do it myself! Works great for me. My 11 yr old grand-daughter needed one for her Mecial Alert bracelet. She's having trouble co-ordinating the bracelet and the helper, but maybe with practice she'll get the hang of it. This product is very helpful for those who have arthritis in the hands. I have a problem with stiff knuckles making it difficult to bend my fingers. I bought this one for my sister. I use this product for those hard to reach bracelets. Its great. I do not need anyone to help me put them on. Great Product! I use this tool almost daily! It is just perfect for my own needs, but, it is very slim in shape, so, it might be a little challenging to clasp if one's fingers are very stiff with arthritis. It's certainly worth a try if you wear bracelets with clasps and you live alone - I love it! I bought this and have yet to find it useful. I can't seem to get the hang of it. My friend who also bought one loves hers!So instead of recommending I would probably have someone test mine out first. I hope I can use it on my next vacation, when I bring out my better jewelry. I was happy to find a product that allows me to put on bracelets that would otherwise slide around my wrist when trying to put on. I wouldn't use this on my gold or sterling silver bracelets because the metal clamp left scratches and marks on the bracelet. It would be nice if the clamp had something over the teeth to protect your jewelry or was made of something other than metal. Because of the potential for damage to jewelry, I couldn't recommend this. The alligator jaws are strong and the teeth very sharp. I haven't used it with my jewelry yet because I don't want to risk a scratch. I am going to coat the teeth with a product to prevent damage. Otherwise, considering using a cloth between the teeth and bracelet. I would recommend knowing how sharp the teeth are. This doesn't make the process of putting on my bracelets any easier because it's awkward for me to hold and still leaves me struggling to hold the loop in just the right position and still get the clasp open with the other hand and hold it open long enough that I'm able to actually get the bracelet hooked. It's almost more difficult than would be to just lay the bracelet on a table top and use your pinky and ring finger to hold the loop end while you pinch the clasp end open and work to manipulate the clasp to a position that allows you to hook onto the loop without losing your grip on the clasp. I can see using it in combination with a magnet or some sticky post it poster putty and reaching into tight spaces where your hand won't fit to retrieve tiny items. I had hoped this item would solve some of my problems with putting on bracelets but it was less than great. Not easy for me to use. Did not like it at all! I still couldn't get my bracelet on - it was extremely difficult with this tool. It doesn't work with all types of clasps. Does not hold the bracelet in a flat position, so it is difficult to maneuver. I returned it. Jewelry clasp is rough on jewelry. The jewelry clasp was purchased for myself for not always do I have help applying my own jewelry. The clasp part is so tough. The clasp has a such a strong grip that it "bites" down on the jewelry, exactly the same pressure as using a garden tool to clip a rose stem, breaking or cutting thru the jewelry. Definitly do not use it on soft gold. TO HELP SOMEONE WITH MOBILITY ISSUES. Have problems with fingers and live alone. I have a lot of troubel trying to button sleeves this item looks great. IT was the least expensive bracelet tool! I can finally wear my gold bracelets again. My wife has problems with closing bracelets around her wraist. I can't put on my favorite bracelet without help from someone. I have arthritic hands and am unable to fasten bracelets. i HAVE TROUBLE PUTTING ON MY BRACLETS AND I'M HOPING THIS WILL HELP ME. I can never get bracelets on by myself, this will help greatly. I can't put bracelets on by myself ! Practical, ergonomically correct product. Inexpensive and easy to order. Make it easier to put on bracelets. I have carpal tunnel. This helps a lot. I have had one of these for years and love it. I'm buying 5 to embellish and use as gifts. I need help fastening bracelets. Made of metal and reading the reviews it will be very helpful for me. It will help put on bracelets easier and faster. My mom and I can't get our bracelets on with out help! I have issues with my hands not working to put bracelets on as well as others in my family do and I felt this would be a great assistance tool. I make jewelry and I can actually make my family members bracelets that have clasps vs elastic stretchy bracelets. Fantastic tool...cannot wait to receive it!! gave a friend a bracelet and both of us need help putting on some jewelry, so have been looking for one of these for her, another friend and myself. SAME AS ABOVE. I HAVE NO FEELING IN MY HANDS. I have difficulty getting my bracelets on. does it hold "lever" in clasp open so not ruining finger nails. Or does it just hold end of bracelet w/open ring while you're holding back clasp lever & slip it in " circle" at end of bracelet "helper is holding? Had those in past but seems to have disappeared. Think it was called something like Bracelet Buddy. Did current "helper" buy out original company???? BEST ANSWER: Thank you for your question. the Bracelet Tool is designed to hold the end of a bracelet while you attach the ends together. We hope this information will be of help to you.